The wearable technology and quantified self movement is blowing up. A 2013 report from BI Intelligence conservatively forecasted a $12 billion market for wearable devices in 5 years. Riding this wave and catering to the increasing number of health-conscious consumers, smart scales give people a real time picture of their nutrition and help them track what they eat. 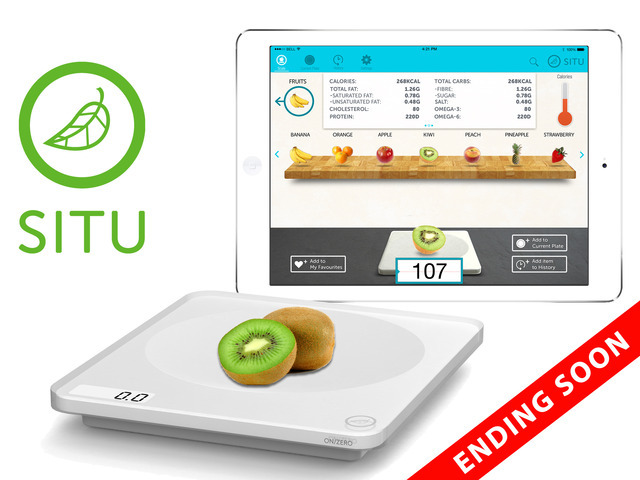 Newbie on the scene UK-based SITU offers a sleek smart scale and accompanying app, which aims to make calorie counting incredibly easy. Created by tech journalist and former Apple employee Michael Grothaus, SITU is intended for everyone from health nuts and athletes to conscious parents and health professionals. The bluetooth-enabled scale weighs your food, in calories, nutrients, grams and ounces, and displays exact nutrition data on companion iPad and Android apps. SITU is able to recognize raw, home-cooked, packaged and delivered foods and tells you everything from calories and protein content to vitamins and minerals. The majority of its food data comes from the USDA’s Standard Reference food database, at least for now. SITU helps retrain the human eye by showing people how many nutrients are actually in a serving of their favorite foods, which encourages them modify their eating habits going forward, Grothaus tells me. And he should know, he lost 60 pounds using SITU. SITU launched a Kickstarter campaign in early April, and since then as raised over 110 percent of its goal. The scale is available to backers at a starting price of £70, approximately $120 US. We caught up with Grothaus by email to learn more about SITU’s target market, data sources, and differentiating factors. Our interview is below and has been edited slightly for clarity. Food+Tech Connect: Your target market appears to be health-conscious consumers. Do you see SITU as a tool for restaurants and institutions as well? Why or why not? Michael Grothaus: Right now are target market is focused on health-conscious consumers, but we’ve had a few small-chain natural food stores express interest in having a SITU in certain sections of their stores. For example, one chain we spoke with said SITU would work great in their nuts sections of the store. People could place a bagful of cashews on it and see the exact nutrition content of them or other a la carte items. 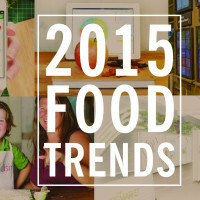 But for now we are focusing on home users because healthily lifestyles start at home–and often in the kitchen. We want to really nail the features of SITU for this group before we expand to restaurants, supermarkets, and similar places. I will note, however, that we have had interest from some health organizations in running feasibility studies on whether SITU use could help at all with childhood obesity. FTC: Where do you get SITU’s nutritional data and how to you keep it up-to-date? MG: Much of the data come from the USDA’s Standard Reference food database. However, that database is actually a mess, with many foods repeated multiple times and even mislabeled. However, it was a good start. But what we then did was heavily curate the database and organize the food into more user-friendly categories. We will be continuously growing the database in the future by adding other databases to it such as international food databases, restaurant food databases, and pre-packaged food databases. We are also planning to crowdsource new entries the the database in the future. Users will be able to both build up their own local food database and make recommendations on what foods should be added. 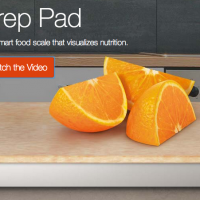 FTC: What differentiates SITU from other smart scales like The Orange Chef’s Prep Pad? MG: The best way to describe the differences is by likening it to the differences between the Mac and the PC. The PrepPad has a very stark, minimalistic and confusing interface. It’s not user friendly. From the start we knew that if we were going to make a product that could enable people to lead healthier lives it needed to be both intuitive and familiar. When testing this design, we actually gave the app and prototype scale to people ranging in ages from the early 20s to the late 60s. Most weren’t technically inclined. We didn’t even tell them how to use the app, we just let them figure it out, which virtually everyone did in under two minutes. That’s how we knew we were successful with the design. But not only does our software differentiate us, our hardware does as well. We put a lot of time and effort into designing the scale so it’s just the right size and can run for half a year off of standard AAA batteries. There’s also nice little touches like a dip in the surface so items such as grapes don’t roll off it; instead they are cradled in the center. FTC: Does SITU have any other health technologies on the horizon or in the works?